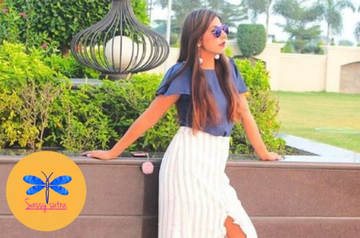 Recently, I got to interact with the Indore based 28-year-old Swati Haryani. She is the founder of SASSY SUTRA - a brand that aims to establish style as the fashion quotient among women. But not through a boutique or a fashion label, but as a stylist who will customize styles for you. Swati begins detailing," Women either can't afford what they wish to wear or don't have the time, capacity (owing to umpteen responsibilities) to visit fashion exhibits or events. And what about small-town women who are not much exposed to trends, but wish to look great? Like the ones in Indore? They too deserve to up their style quotient Mahima, isn't it. That’s why I started Sassy Sutra a year ago. I love being stylish and sassy. Being a mom and a fashionista at the same time is a bit challenging and fun at the same time. Sassy Sutra is not only for youngsters but for all the women who are willing to stay updated with the latest trends. And this is what makes SASSY SUTRA unique in its own way." And if you look at the FB page, you get tips and tricks to style yourself as per your body shape and likes-dislikes. Her Social Media pages also say how SASSY SUTRA is a formula to stay SASSY! So does this formula reach people? It works both on one way communication as well as two-way communication. And that too through social media only! For instance, Swati shares what will look on a girl/woman who has a particular body shape. That's one-way communication to which, women will post their queries as per their own body shape, as to what will look best on them. And their Sassy Sutra changes the communication mode to two-way giving them tips either through comments and even one to one phone calls. Seems like a cake walk? No, it isn't. Because every story of courage has another side too. "Mahima at the time when people learn to explore the world, I got married. I was just 20. And soon my daughter was born. I stay in a joint family. I had a passion for styling and fashion, but starting at the stage when you are already a daughter in law and a mother was not at all easy for me. I was 27. And one day I confided in my husband about starting SASSY SUTRA. He heard patiently and said I can give it a try. I still remember I was so excited that I didn't sleep that night. I made my social media page, 5 AM in the morning!" Swati chuckles just like her tiny daughter. And she goes on, "I am the first one to work in the fashion industry from my family. So, the worst part that came was people around me began noticing me going full throttle to achieve success, but instead of encouraging me, they began passing negative comments. There was a point when my family members got influenced by the people and asked me to shut my page and join the family business. But I didn't give up. And today my day that is juggled between raising my daughter and raising this second baby -Sassy Sutra - it is part of me so I don't need to manage it separately. It took time to stabilize the work, but I have done it! And that's my pride." I listen with awe and I ask her, "Swati you detailed all struggle and challenges and there on victories...in a single breath. What gives you such a vision and inspiration to stride ahead without batting an eyelid?" "Well Mahima, we all have our own struggles, don't we? After giving birth to my daughter I started losing my complexion. my hair and my health. And this was the stage when I lost my confidence due to all the negative comments that were coming my way every single day. But after a year, I thought how long will I stay in such a mental state? I have to bounce back. I had to be "Sassy Swati" again to be able to launch Sassy Sutra. How will I make other women feel Sassy if I don't bounce back? So I started rebuilding myself. I started working on my own style first, and slowly, gradually regained my lost confidence. And re-discovering my hidden strength made me more powerful and beautiful from within." She laughs, "Arey, this is not a work promotion, it also taking pride in who I am! 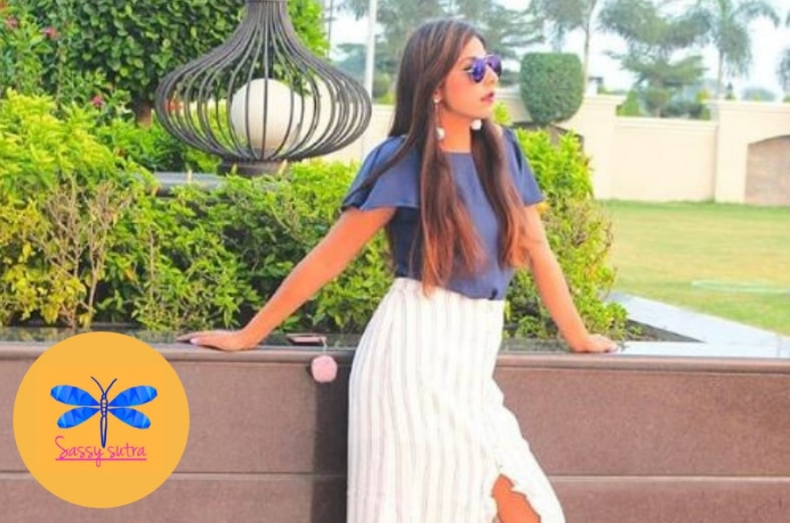 Moreover, though I am a small town girl educated in Bhopal and later Indore, and me taking up Advertisement in my Bachelors' Degree came as a big help to take Sassy Sutra to desired women." You will be happy to know that Swati Haryani is the only Indian to get featured as the face of Revamped Cosmetic which is an international brand. A celeb coming from a small town! She laughs again saying, "I remain Swati, just Swati for you all...an emotional person who is just like other women, but is head-strong when it comes to chasing her passion. Oh, by the way, I love to dance too." And I ask her, is there anything she can't do...and we both laugh aloud. Talking about her journey at SHEROES, Swati says, "Mahima, me joining SHEROES has been a great ride. I come from Indore, a usual small town of India, where generally women aren't given the desired as well as deserved freedom to not just chase their dreams, but also share what they feel." We read how Swati's life is an example of it. And she adds, "But at SHEROES I saw how women are free to speak their mind. Share about their lives and also seek guidance. Freedom of speaking your heart out and the vibes SHEROES has are unbeatable. And I have learned a lot as a woman, as a human being from various posts I read there." Someone is calling on the other phone, seems a woman needs Swati for her SASSY SUTRA or the style mantra as I will now rejoice it as. So Swati bids us adieu with some SASSY photos and a SASSY message! "Never stop believing in yourself and start working towards your passion no matter what your age is. It will give you immense happiness and respect. You got one life and it’s yours first more than anyone else’. Don't forget your family and responsibilities, make a balance because at the end of the day they are the people who will be by your side to love you." If this SHERO has touched your life in some way, do share her story and also drop some love in the comments below. And we will continue to bring you some more sassy stuff in our ongoing #MeetTheSheroes Series.